Super Smash Bros. 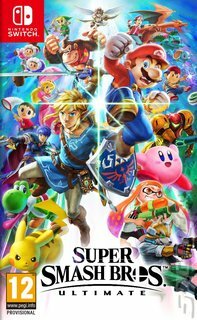 Ultimate takes its name so seriously it's a little difficult to know where Nintendo will go after what looks a lot like it could be the definitive Smash Bros. game. Fortunately, that's a problem for the development team, not us. We get to sit back and enjoy beating seven shades of power-ups out of a veritable who's who of characters to have graced Nintendo's consoles. Nintendo is promising that Ultimate will include EVERY PLAYABLE SMASH BROS. CHARACTER EVER. That means everyone from Mario to the Wii Fit Trainer to three (three!) different types of Link, plud a few newcomers for good measure: Inkling, Ridley, Isabelle, King K. Rool, Incineroar, Simon Belmont, Richter Belmont (Echo Fighter of Simon), Dark Samus (Echo Fighter of Samus), Daisy (Echo Fighter of Peach), Chrom (Echo Fighter of Roy), Ken (Echo Fighter of Ryu). You can pit them all against each other in a host of different modes, including a free-for-all eight player battle royale. There have been enhancements to how it all plays, too, with faster combat, new items and attacks and new defensive options. Also included is what looks suspiciously like the most robust campaign we've ever seen in a Smash Bros. game. World of Light sees the entire roster whisked away to a strange world. To rescue them all you have to navigate an overworld map that will take you to fights with dark versions of each character in turn. Beat them and you unlock the spirit of the original and they become part of your line-up of available characters. Look at the character list below, that's a lot of content! So, without further ado, the complete character roster of Super Smash Bros. Ultimate: Mario, Luigi, Peach, Bowser, Bowser Jr. (and all Koopalings), Yoshi, Rosalina and Luma, Wario, Dr. Mario, Donkey Kong, Diddy Kong, Samus, Zero Suit Samus, Ice Climbers, Kirby, Meta Knight, King Dedede, Link, Zelda, Sheik, Ganondorf, Young Link, Toon Link, Ness, Lucas, Fox, Falco, Wolf, Marth, Lucina (Echo Fighter of Marth), Ike, Roy, Robin, Corrin, Pit, Dark Pit (Echo Fighter of Pit), Palutena, Pikachu, Jigglypuff, Pokemon Trainer (Squirtle, Ivysaur, Charizard), Greninja, Pichu, Mewtwo, Lucario, Villager, Olimar, Captain Falcon, Little Mac, Wii Fit Trainer, ROB, Duck Hunt, Mr. Game &amp; Watch, Shulk, Sonic, Snake, Bayonetta, Cloud, Ryu, Mega Man, Pac-Man, Mii Fighters (Brawler, Gunner, Swordfighter), Inkling, Ridley, Isabelle, King K. Rool, Incineroar, Simon Belmont, Richter Belmont (Echo Fighter of Simon), Dark Samus (Echo Fighter of Samus), Daisy (Echo Fighter of Peach), Chrom (Echo Fighter of Roy), Ken (Echo Fighter of Ryu). 'Ultimate' barely seems to do it justice.